"I started with Tim when I was 11 and am now almost 17. Tim has taught me so much over the years. Tim teaches everything from simple chord patterns to extremely complicated guitar solos. And he is so patient. I learned so much music theory from Tim that I feel ready for college soon where I plan to get a music degree. Tim is seriously THE BEST!" "An outstanding teacher makes an outstanding student. Tim is just that – an outstanding teacher which can clearly be seen by the high level of performance skills of his students. Tim doesn’t just go through the motion of teaching but immerses himself in his teaching by ensuring that his students not only learn to play the guitar, but continue to advance to a professional level." “Tim Kleiman taught my son how to play the guitar from the age of 14 until he went away to college. Tim was extremely flexible over the years, allowing my son to try both bass, guitar, then back again to the bass, where he ultimately excelled. Over the years I found Tim to be extremely patient, punctual, polite, and age appropriate as my son matured. He also became a mentor of sorts, and all that came back to me was good and sound advice. Tim also enhanced his lessons with music history and theory which flushed out the whole learning curve for my son. Although Tim teaches all ages, he realized the importance of playing together, so decided to rent studio space every week, where the "Band Experience" could be realized for all his students. This was added incentive to practice, and offered very unique encounters for all involved. In short, Tim Rocks—We LOVE him!" "I started with Tim in my early 20s, when I already had several years under my belt. I had hit sort of a personal wall that I was having trouble getting over, and Tim had so much to sit and teach me. He opened up new doors and avenues that I didn't think were available to me before. He doesn't just offer new skills and experience, but also inspiration to create new and innovative music." "Tim is the kind of teacher that will evaluate your current skills and develop a specific lesson plan that will raise your musical world to a complete different level. 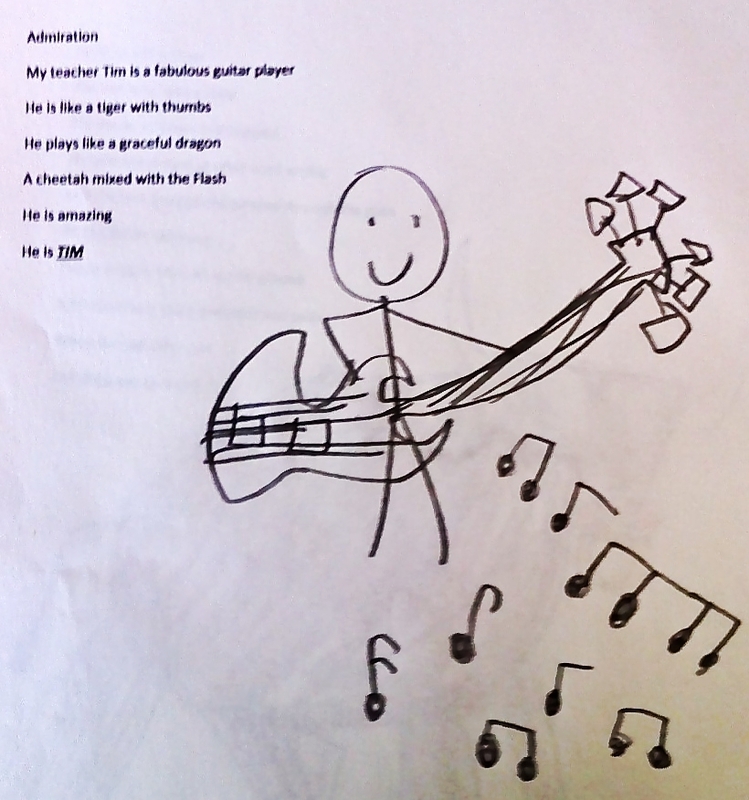 Thanks to his tutoring I am now a professional guitar player in a working rock band." "Awesome! I have been Tim's student for 2 years now, and I have learned so much from him. He has not only taught me my favorite songs in guitar, he has taught me awesome rock songs that have been fun to learn. He has also let me play with his band on stage which was also very fun to learn. I learned what its like to be in a band. He taught me how to prepare for a concert. Even now, I enjoy learning all kinds of different songs from heavy rock'n'roll to sweet acoustic. He can teach it all."